Earlier today there was an minor harmonic tremor in Katla volcano. It’s source was inside the Katla volcano caldera as before, it is impossible to know the exact location of the source this harmonic tremor spike. But earthquakes around that same time might give a clue about it’s origin. Harmonic tremor can be found close the end of this tremor chart. It is peaks from the background noise that is currently taking place in Katla volcano on this SIL station. Copyright of this picture belongs to Icelandic Met Office. Harmonic tremor can be found close the end of this tremor chart. It is peaks from the background noise, it small but it can be found. Copyright of this picture belongs to Icelandic Met Office. Current earthquake activity in Katla volcano caldera. Copyright of this picture belongs to Icelandic Met Office. This harmonic tremor spike was small compared to the one on 8 – 9. July 2011. But this means that this area continues to be highly active and dangerous in my opinion. While there currently is an little pause ongoing in this area. I do not think that current events are over. When they end and how I don’t have any idea. But I am guessing that this is going to end in an full eruption of Katla volcano. When that might happen is something I don’t have any idea about. For the moment. The only thing that can be done is to wait and see what happens in Katla volcano. This entry was posted in Dyke intrusions, Earthquakes, Harmonic tremors, Hydrothermal, Katla / Mýrdalsjökull, Magma, Monitoring, Volcano. Bookmark the permalink. Hi all, an amateur here so humor me if this sounds like an unusual question. I know that when Mt St Helens erupted (VEI 5) it destroyed all the glaciers on top of it. Judging from satellite maps the size of the glaciers on top of Washington State volcanoes is comparable to the size of the Eyjafjallajökull glacier (but not the Mýrdalsjökull). If Katla were to erupt with a VEI of 5 what size fraction of the Mýrdalsjökull glacier do you think it would destroy? Would the entire area south the glacier be flooded or just a few little areas? Or does no one know yet and we’re in uncharted territory? So, I’ll drag my reponse over here as well. That really depends on the physical structure that the theoretical VEI-5 erupts through. VEI is a measure of how much stuff comes out… not how fast or in what fashion it does. A fissure eruption could ooze and spit for months and eventually reach VEI-5 while not destroying the terrain around it. In Mt St Helen’s case, you had a flank collapse and rapid decompression of the emplaced magma. This made a directed blast that took every one by surprise. If (HYPOTHETICALLY SPEAKING) Katla had a whole caldera event, then yeah, kiss the glacier goodbye. Most likely it will be localized to one of the sectors of the existing crater, and in the worst case, probably an opening somewhere along it’s fissure swarm. If it’s violent and does the whole of the VEI-5 at one time, then what you are asking would be possible. If it’s a long drawn out affair that eventually reaches the VEI-5 volume level, then no, it won’t match the scenario you have asked about. FOR THE TRANSIENTS: This is just a discussion about what it would look like if it did happen. Not a prediction at all. Do not assume it is or read anything into it. I am not a geologist or a professional in the geosciences. Does Katla have its own way – like a signature event – of showing when an eruption is about to happen? Or does the activity just build and build until it erupts through the ice cap above it? That is in fact not known. I am yet to check the history on this to be sure. But from what I can remember, that has not been recorded in earlier eruptions. There was an similar event in the year 1955. But I do think that there might be important differences from what is happening today. But that is just an speculation on my part in regards to this matter. So I ask to people who live in Iceland and know the emergency procedure: are all the people that live in the area south of Myrdalsjokull evacuated when Katla gets to point it’s at now? Or does Katla have to reach an even more dangerous stage before everyone is evacuated who’s south of the glacier? I’m just curious. I watch the webcam and wonder about the people who live there. VEI is a measure of how much stuff comes out… not how fast or in what fashion it does. A fissure eruption could ooze and spit for months and eventually reach VEI-5 while not destroying the terrain around it. In Mt St Helen’s case, you had a flank collapse and rapid decompression of the emplaced magma. This made a directed blast that took every one by surprise. FOR THE TRANSIENTS: This is just a discussion about what it would look like if it did happen. Not a prediction at all. Do not assume it is or read anything into it. I am not a geologist or a professional in the geosciences. I just plot stuff and my formal training is in electronic warfare, not volcanoes. They have emergency plans in place if there is an large eruptions in Katla volcano. So far they have not evacuated Vík (400 inhabitants, largest town of South Iceland and a very touristic spot). Not even after the flood. I think they will wait until stronger earthquakes start, but that might be playing with fire, as Katla might erupt suddently (magma is already close to surface, and larger flooding could happen). Anyways, press: this is just SPECULATION. Not any prediction! The eruption might happen in soon, or might only happen years from now. They are of course prepared, emergency plans exist and the people who live there also have emergency drills. I am sure people are prepared, but I must confess I wouldn’t be comfortable if I were in Vík right now. This hole Katla event feels like walking in high heels to me. There is something, yet there isn’t really something. If we were sure there had been a small eruption, we would just say: OK, it’s over. But this is not the case, and we know not enough to guarantee we are safe. Well, that will teach me to read down before cut-n-paste of my response. Sorry all for the repeat. Someone want to explain me how you see that a spike is harmonic tremor and not an EQ or background noise? Thanks! You can see how the pattern suddenly changes. It is like what happened on Friday + Saturday. Just on a lot smaller scale. This was maybe just the hydrothermal area boiling under the glacier or some type of over pressure event taking place in the volcano system. Don’t know much about volcanoes, apart from they can be very deadly. I got interested when Eyjafjallajokull erupted and the mention of the connection with Katla. Then I read of Katla’s history and got very interested. I’ve been reading your blog with great interest. Now Hekla is said to be ready to erupt. How often in Iceland is it that the ‘2 angry sisters’ are ready to seemingly erupt together? Hello Again Everyone! My My You HAVE been busy! Well, So have I! Patrick Linsley’s Question is a natural one. And Jon will no doubt find out any information that exists about it! But there has been a recent survey & Thorough Study to find out “When” & “How” KATLA (or future Eruptions) are going to happen, by all the local experts. According to this Recent Documentary, it may not cause as much Chaos as we originally calculated due to the fact that 7 times out of 10; the Ash Fell Very Local to the North of Iceland. NOT all across Europe. This was Broadcasted just after Jon’s Initial Alert at the end of June I think. So it only Mentions what’s happened recently. However, this is a Fascinating New Look at their Latest Data! I Was like a Pig in Sh… Mud! (Cough!) I Won’t SPOIL it for you, but ALL your Questions get Answered in it, one way or another! And for those that don’t want to wait, It Cost me £5.65 to get a months worth of Premium Download Speed for “Filesonnic”, & is considerably quicker downloading! More for amusement than anything else. I’ve seen it mentioned, (Raving, over on Eruptions Blog) that volcanoes are probably best modeled under a Poisson distribution if you are going to try and guestimate the likelyhood of an eruption. Well.. it sort of makes sense, Poisson is designed to model random arrivals when the only thing you know is the rate that the events occur at. Taking the number of years and dividing by the number of eruptions, and using that as the rate seemed like a good way to tackle it… so I tried it out and threw in a normal distribution to see how they compared. Based on that, it seems that Katla has a bit of cooking to do before it’s time for supper. HOWEVER. Hindsight is 20/20, and if this method is sound, it should work for past events. There should be a pretty high hit rate on past events. In this plot, I calculated the Poisson probability for the year in question, given the parameters up until that point in time. It was most revealing. Apparently, Katla could give a rats arse about what the probability happens to be. Most of the time it goes off well in advance of what the distribution predicts. Why is is so far off the mark? Pretty simple answer, really. Poisson is designed for random unrelated events. A volcano is sort of dependent on the last few eruptions in how it carries forth with the upcoming one. So they are anything but unrelated. There are a few professional stats people who will scoff at my plots… but thats okay. I already know that I do not actually know what I am doing. So, no hurt feelings here. Whoever scoffs at them doesn’t deserve to be here. Lurking I always enjoy your posts! You certainly have proved that Katla activity is not random . You also prove, without doubt, prediction on future activity is impossible as yet . You’ve hit the bull’s eye! You can not apply Poisson’s distribution (nor Gaussian either) on volcanoes. First, as you stated, volcano eruptions are not unrelated. The different eruptions of a given volcano are “ruled” by the common magma source for these events, so they are not unrelated. Secondly, very closely to the first one, they are not independent, not even within a one given system. Major eruptions tend to lead to longer dormant stages. Third, as a nail to the coffin, the eruptions are not random. They are deterministic events, caused by deterministic laws of nature: Enough pressure pops the cork! I posted a question re: the gas content of Katla. I remember reading an article or study of the expected chemical beakdown within the Katla system, but haven’t had time to find it again. I am interested in finding out the potential effect of gas in any Katla eruption. I thought it was alarming that the event of July 9 resulted in the evacuation due to poisonous gas. Now, I am not a fear mongerer for those with delicate sensitivities to the objective discussion of natural events that may be unpleasant, but in reading about the horrible 1783 Laki event, it was primarily the gas that resulted in so much death and destruction. I didn’t hear about gas when Grims or Eyja erupted. So the question burns, what kind and quantity of gas could possibly come out of Katla. The calculated sulphur concentrations (cs) are in ppm by mass. I have no idea if those numbers are large or small for a volcano… only that those are the numbers that come out from the calculation. The SO2 gas flux produced by the eruption was ~3000 tonnes per day. Approximately 70% of the SO2 flux was produced by the fissure which opened on 31st March, with ~30% emitted from the 21st March fissure. Note… “Cs” is calculated Sulfur. I used equation 2 [magmatic tephra] from that list since it seemed like the best match. Something to consider… and a huge path for error, is that those equations were intended for “basaltic flood” lava. Eyjafjallajökull and those samples in Wial’s link were not, (or most likely not) this type of lava. In other words, take it with a grain of salt, it might be fully wrong. After all, it is just a ballpark estimate and the best that I can come up with for now. Jon, I hope you don’t mind me saying this, but as I’m flying to Europe tomorrow. 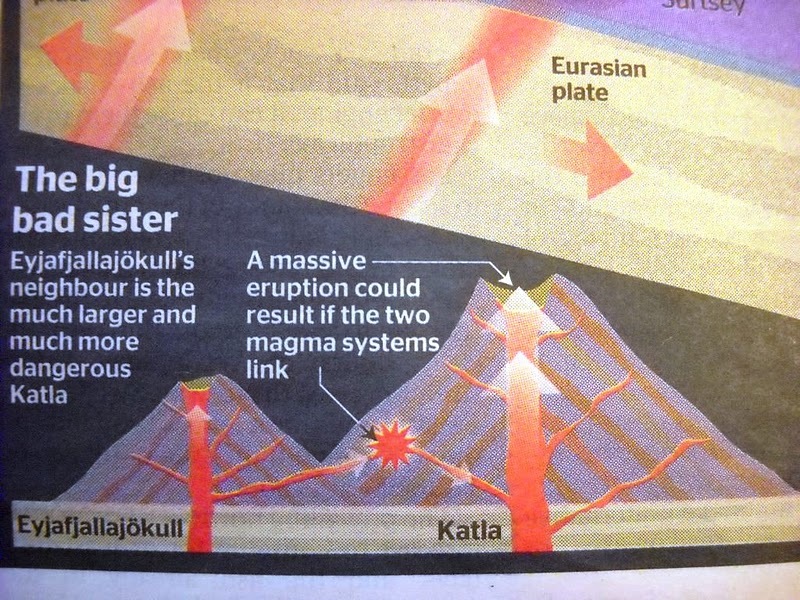 I really hope that Katla doesn’t blow. Well, at least not for the next three weeks. So, what we’ve seen yesterday mean mean nothing at all.OK. Time to go to bed. No.. not that it means nothing… just that even several years down the line we may still not know. Volcano building in Iceland is not always visible due to the large glaciers that cover some volcanoes. Makes the suspense all the more gripping. Gulp. Its either over or its not for the current event. I guess not, she is not quite finished. HVO SIL station is currently showing a small tremor spike. This was something from Vatnajökull glacier. It was strongest on Skrokkalda SIL station. But it did last only for about ~10 min and I am unsure what volcano was creating this minor harmonic tremor spike in the charts. But what volcano created this in or around Vatnajökull glacier is currently unknown to me. Looking at the stations around SKR the signal seems to diminish. Could it be a tremorpulse from Hamarinn or Bardarbunga? They are closest to Skrokkalda right? I think this was a tremor spike from Haamarin volcano (which belongs to Bardarbunga fissure system) and is the closest volcano to Skrokkalda. And the spike yesterday, was it from Katla? I have a question concerning the frequency bands in the tremor charts. It is pated into 0.5 – 1 Hz, 1 – 2 Hz and 2 – 4 Hz. In for example Noise and vibration different frequencies carries different information in different situations. Before an eruption is any of them more important, showing signs of different activity etc.? Before an eruption they all start to clime rather fast upwards, as magma on the move creates a lot of noise. The 0.5 – 4 Hz is just the frequency in question. Nothing else. Dunno but it looks a little bit like a weather induced rise. Winds appear to be tame in the Mýrdalsjökull area at the moment. No precipitations either. Just a very very slight increase at the end of the timeseries. This doesn’t sound Good to me! Still, I guess all we can do is keep a Check on it. Yes and the connection between conduits is most likely completely wrong. 😉 Even scientists are not sure of a connection between the two (plumbing wise). Lurking, how did you get to the poisson distribution of Katla eruption, which would make it more likely to erupt by 2060, when its average repose if around 40-80 years, and we are already with a 93 year repose. I haven’t understood your reasoning. Have you included in the calculation for a future eruption, the intensity and frequency of former eruptions? Have you tried fitting your equation for previous eruptions to see if it fitted? I think by using all these variables (in addition to inflation measurements) it could be possible to somewhat model the eruptive pattern of a volcano (only to some extent of course). Jon and others: I just thought about something different, related to Grimsvotn and Bardarbunga. I remember we were discussing at a time last year, that there was some lateral movement of magma from the proximity of Bardarbunga into Grimsvotn. A few months later, we experienced a very strong eruption of Grimsvotn. Do you think, this lateral injection of magma from Bardarbunga was responsive for the unexpected intensity of last Grimsvotn eruption? Besides that, it seems clear that most activity in Bardarbunga in recent years focus in Haamarin and Kistufell fissures. Maybe this will be the place of Bardarbunga’s next eruption. Poisson is rate based. In other words, how many over a period of time. 131 eruptions over 8379 years comes out at about 0.0156 eruptions per year, or 63.96 years between eruptions. With 63.96 set as the µ, P= ((e^-µ)(µ^k))/k! As for average repose time, the average duration between eruption starts is 64.45 years, using the list of 131 eruptions from the Global Volcanism Program. No make the curves I ran the appropriate routine for number of years. I then slew the curve to start at the last known eruption. This may be the source of the disparity since I used the 1999 event as the base. The last two eruptions are listed as [UNCERTAIN] and probably should not be considered. Placing 1918 as the start of the curves yields a more sane curve set… sort of. This is more in line with the plot that I got when using known “VEI-3 or higher” eruptions. Is there room for error on my part? Most definitely. I am of a firm belief that these distributions are of little use with Katla. They may give you a ballpark estimate, but if your having a Hockey match, standing around out in the middle of a Baseball field isn’t really going to do you much good. I do not know how to write this in proper code. But I use this formula when I try to figure out when volcano is about to erupt. d is for number of eruption. g is for nominal space between eruptions. j0 is for effects of the eruption on the magma chamber (rather, a guess on that factor). This formula is still work in progress and is subject to a change on later date as more data is collected. Use with care. So last eruption started on Oct 12. 1918 (best information) and ended on Nov 14. 1918. According to this formula (now this is just speculation on a untested idea. It might not and most likely is not going to work at all!) next eruption should be around July 14. 2011 around 16:30 UTC. The clock however is rather an guess then anything else, as it is based on a Cc-d factor as I call it. This is the result from the last few months worth of data collecting and analysing in my head. But that is how I work with stuff in early stages. If you can use this formula after editing in your plot. Try it. Interesting formula Jon. Have you tested it on past eruptions to see how accurate it is? It is semi-tested. This is latest version, yet to be tested. Other versions have had tests, they failed. Very interesting equation! Frankly speaking, it seems to me it does not have any sense! I mean, you can not use it for any real variables, as the equation does not account correctly for units of the variables used. Or, have I understood it incorrectly? Can you given a numerical example with units, e.g. for the 1918 eruption? I just use the available data that I got. The numbers are what is measured, however good or bad that is. This formula is wrongly setup here. It is meant to be like this. This is just an early development work. Nothing more. There is room for a lot of improvement to be maid. And another thing… the rate data and average repose changes depending on how much of the list you use. If you throw out all data prior to 920 and only use info in and around the start time of (known) human occupation of Iceland, it gives you an average repose of 40.56 years and a rate of 40.40 years per eruption. What on earth is going on here http://hraun.vedur.is/ja/oroi/skh.gif? Can someone tell me how you get a negative value for the strength of the earthquake? Is that why some show on the map from IMO but not on the graph underneath? >Can someone tell me how you get a negative value for the strength of the earthquake? Think of the magnitude as the exponent of a base number. If the base number is 10, magnitude -1 would mean that the earthquake is “worth” 10^(-1) = 0.1. Magnitude 0 would mean that the earthquake is worth 10^0 = 1, or in other words, 10 times “bigger” than the magnitude -1 earthquake previously mentioned. By the way, actually when comparing earthquakes by wave amplitude (the “shaking”), a base number of 10 is used. When compared by energy, a base number of approximately 31.6 is used instead. >Is that why some show on the map from IMO but not on the graph underneath? That graph only shows earthquakes of magnitude 0 and above. Earthquakes below this threshold however get plotted on the map. Cheers G and MrM…. unfortunately my Maths A level was 35 years ago! But I think I get the gist of it now. Many thanks for the explanations..
Looks like another quake on Jon’s geophone now. Nevermind, I guess it was just noise on Jon’s geophone. It means very small. A lot less then one. It is the exponent like 10 to the minus whatever.i.e. 0.00001 would be -5. Ta to you TM too. Brain hurting from all the maths… did just enough to get into medical school! I think it might have been just wind picking up? Godabunga SIL station appears to show an ongoing quick-ish increase on low frequencies. By the way, could somebody post a link for Iceland stream flow data? and from the homepage n click on hydrology, the one with the blue boarder, not the silver-grey one. then you can click on one of the colored dots on the map. Is this same as yesterday? A minor harmonic tremor? Or is the change so small? There seems to be a small harmonic tremorspike at GOD SIL station at the moment. It is also visible at ALF station although a bit smaller. It seems the chart you linked to is a more linear chart while the SIL stations show a more “raw” picture of the current tremors. Thank you for your answer! So its small? It seems to have risen just a little there, not much to worry about unless it looks like it did the other day. That chart only goes to April 2011 by the looks of it. It’s a year’s worth from the eruption of Eyjafjallajokull. Is this still small http://hraun.vedur.is/ja/Katla/god_trem.gif ?? That’s the same graph that someone linked to further up and is only showing tremor up until April this year. Somewhere up there someone was saying that nothing would happen after someone posted the similar events in 1999 and 1955….but please remember, neither on those times had eyjafjallajokull gone off before hand. All documented(920 is the earliest record that I found) eruptions of eyjafjallajokull, have been followed by Katla, within a year, up until around 3 years later. The graph is current they just haven’t bothered changing 2010 to 2011 yet for some reason lol. The red one seems to be only increasing a little bit. What does that mean? And there arent a lot of eathquakes at the moment. I’m thinking it might really be due to weather conditions slowly getting worse over the past hours in the area, after all. It appears that wind strenght has increased since last time I checked. Jon’s Hekla helicorder seems to be affected too. So you think its wind? Is the weather bad in Iceland? I’m checking http://www.vedur.is and it appears it’s getting slowly and progressively worse as time passes in the southern area. And it it local, not affecting HVO much. Maybe geothermal though. Hopefully Jon can tell us. The increase in that link is not very big but the change can be seen. Some other volcano is making harmonic tremor. This might however just be local glacier flood or movement creating this harmonic tremor spike on Skrokkalda SIL station. But somehow I find that unlikely to be the case. But I don’t expect anything happening from this as there are no earthquakes and this are just small harmonic tremor spikes. I am going to write about this later tonight. Would that be Hekla Jon? The temporary service of transporting travellers across the Mulakvisl river with trucks and a 4WD bus has been cancelled (at least for some time) after the bus got itself into trouble (source: http://ijsland-enzo.nl/ijsland/actueel_nieuwspagina.asp in Dutch language). Does anybody know if the river’s water level might have risen during the last hours? I try to post this again. I took so log to get i moderated. I have a question concerning the frequency bands in the tremor charts. It is divided into 0.5 – 1 Hz, 1 – 2 Hz and 2 – 4 Hz. In for example Noise and Vibration different frequencies carries different information in different situations. Before an eruption is any of them more important, showing signs of different activity etc.? Is that a small tremor at the end now? That is en earthquake, somewhere else. I think it is extreemly hard to say. The olnly thing we know is that if Katla get a full “blow out”there will be a massive shift upp and maybee overload at some sensors and a gigantic flood. Can I ask a Question! One that is a bit more objective! If KATLA was to Go off, & gave off many hours if not Days of Harmonic Tremors, What would it look like on your Equipment? It Seems to be very sensitive doesn’t it. If even the Wind gets picked up & that. I mean, Would it just look like a Long massive Black Brick Wall of MAXed out Waveform? Because to me, that looks like a Full on afternoon of restless earthquakes (Swarm). I too am an amateur. I will try to explain my way as How I read them without too much technical stuff. I am sure Jon and other experts will say if I am wrong. The three coloured bands on the graph show average wave length of tremors. Tremors can be cause by wind buffeting the seismometer, Sea waves if the Seismometer is near the coast, rivers and glacial movements, man made vibrations such as cars, earth movements due to the many faults in celand moving, and volcanic activity . The blue graph shows the deepest movments usually. The thickish band at the base shows background and on going vibrations, the earthquakes cause the spikes. The blue tends to show also movement of magma. Green is the middle band and if magma is rising then that too will “spike”. Red is low frequency waves. If that starts spiking in an are near a volcano then it means that magma may be moving upwards near the surface or there is a lot of glacial movements. This graph shows relatively quiet activity with just a few spikes. all the bands are similar. When something is happening under a volcano there will be a definite break in the pattern like this near Katla. You cannot mistake that difference! Harmonic tremors are difficult to identify but with practice it comes! My advice is to follow Jon’s blogs. examine the graphs and compare them. Learn where the SIL stations are. Those are the places where movements are recorded. Read as much as you can about the geology of Iceland and things will become more clear. This is very simplistic but may lead you on to a better understanding. We are all learning here!! Jon, I think your equation makes lot of sense, but have you got to that result from the formula? Which units do you use for each variable? Do you use constants in your formula, in addition to what you have shown? Have you tested for other volcanoes? I am curious to know what does the formula gives you for the next eruption of Hekla, Askja and Bardarbunga. And congratulations its seems to be a great piece of work! I just speculated about something different. This tremor near Haamarin, and tremor near Katla could fit perhaps what we would observe prior to a Eldgjá-style type of eruption. What do you think it would detect if Katla or Bardabunga would open such a long fissure as happened in 934, 1477 and 1783? I hope these tremors in these places near Vatnajokull western edge and Katla, does not mean that. As it is work in progress it has not yet had a lot of success. But sometimes a failure is an progress in it self. So I am working on this idea. If it is going to go anywhere or just tossed into the trash later we just have to wait and see how it goes. OOps! I am sorry Sissel I meant this reply for William Gunning. I apologise! Time for another coffee and a rest I think! You’re welcome William. It has taken me some time to get even a little way into understanding the “jargon” let alone some of the most in depth calculations. I just watch and enjoy reading the very informative posts. You may also like to visit this blog too. This is written and run by Dr Erik Klemetti. There you will find lots of information about volcanoes all over the world and input from many respected scientists. I have found friendly people there too who are very helpful and don’t mind answering questions that deal with very basic knowledge. There are also web cams that show volcanoes all round the world. Fascinating stuff! Where is the new blog?